As it was mentioned before, ITBMU was found on a compound near the sacred Tooth Relic Pagoda. The Pagoda is well known in Myanmar Language as ‘Shwedo Phaya’. It was constructed in 1996, two years before the inauguration of the University. In common to most of the temples in Myanmar (not the Pagodas), Shwedo Phaya, too, has a hallow chamber where the replica of the Buddha’s Tooth Relic, in China, is enshrined, inside a glass casket. 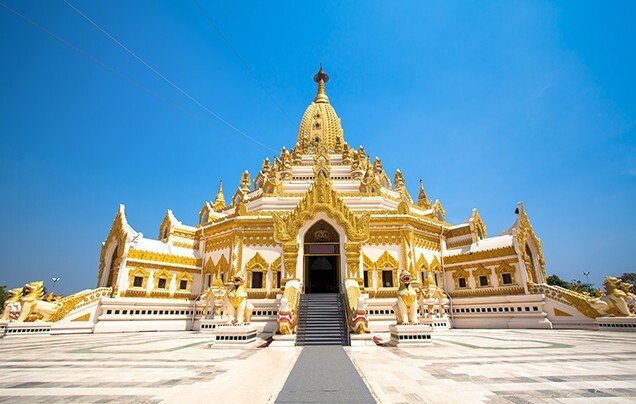 Rising 162 feet high, the Pagoda stands in a majestic but serene appearance. Students of ITBMU, on this account, are greatly blessed as they could, daily apprehend and visit the sublime monument. The Pagoda is even visible to the hostel premises, and, to visit it, one just needs to cross the road, running in front of the University. Peaceful serene feel of the surrounding environment of the monument appeals people’s desire to tranquility. Therefore, students of the University are often seen visiting the Pagoda in order to pay homage to the Replica of the Tooth Relic and to enjoy the calmness of the premises.